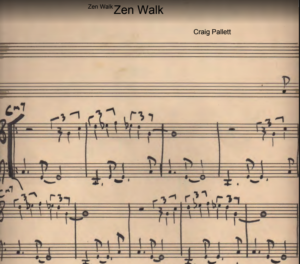 Thought it was time to write a new article about a new project that I just released, with Andy West, called Zen Walk. Andy and I decided to do a 5 tune release. We started several years ago, exchanging works which we thought might make a good package. We probably exchanged like 15 to 20 pieces to each other and decided to work on 5 of them. Four of the Five pieces are actually from a project I created around 1989. My friend, keyboardist Steve Kaplan, asked me if I wanted to create meditation music for producer David Kershenbaum for a spiritual organization. So I proceeded to write like 10-12 new simple tunes, and convinced Steve Kaplan to show up at David Criggers studio, and we recorded one pass for each tune, of Steve playing a single keyboard, probably a Roland Jupiter 8 onto 2 track tape, and we recorded the Midi at the same time into a hardware based sequencer. All that still have of these sessions are the MIDI Files. 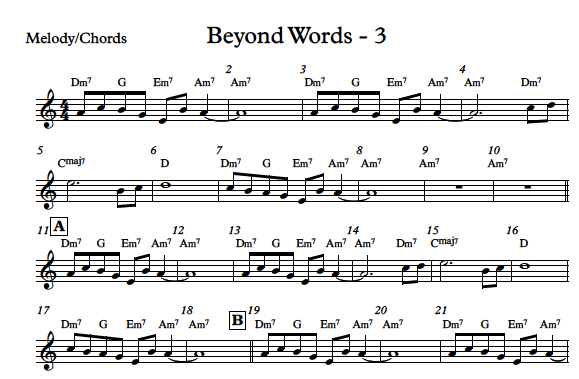 This is a Garage Band snapshot of Steve’s 1989 midi recording of the first 8 bars of one of the tunes called Beyond Words. This is the actual lead sheet, Steve played from my sketches. A real simple melody with a few chords. So at the time, I created 10 works designed for meditation, and eventually software like Sibelius arrived, and I translated all the lead sheets into Sibelius. But besides a simple lead sheet, I have always had the original midi data, created by Steve to a synced click track, which allows you to open the data pretty much in any Digital Audio Workstation, and in either Sibelius or Finale notation software. Several of these works I have already used in other releases. So with Beyond Words, the original midi data is used to build the primary higher voice orchestration, both Andy and I decided to fully create this project using only Apple Logic, and use all the internal synthesizers and we built up these original tracks with a variety of different instruments, using MIDI filters to extract parts, and then expand them with different sounds and additional arpeggiated patterns. Andy for example, setup and programmed all the percussion sounds, and added an actual Electric bass, I created a secondary Wavy Organ part, and organized the over-all structure of the resulting track below. True Freedom is a piece on my Ensembles CD, which is one of these original Steve Kaplan MIDI performances. 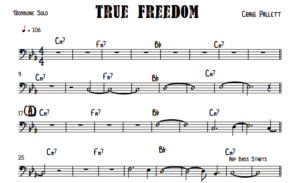 True Freedom eventually became a multi-media piece for solo trombone, with additional musicians being added, Andy West on bass, Alan Kaplan on Solo Trombone, David Cossin played Live Drums and Percussion, and Ronnie Gutierrez played a variety of Hand Percussion, and I added 3 new Guitar Parts for Steve Bartek, an Acoustic Guitar, Electric Solo and EBOW Guitar. You can view this guitar score here… But I only used the original midi tracks and didn’t include Steve’s performance with release. This is the eventual track which resulted, and was co-produced and mixed by Andy West for the Ensembles CD. “Who Is That Who Is” was also originally one of these 10 works, and I re-orchestrated the original MIDI data into this eventual arrangement on the Tantra CD. It features Steve Bartek – Guitars, David Crigger – Live Drums, Leon Gaer – Bass, Steve Kaplan – Acoustic Piano Solo, Keyboards, Shelby Daniel – Vocals, Craig Pallett – Keyboards, Electronics. For Zen Walk, Andy and I decided to use Steve’s actual recording, and the resulting MIDI data to re-create the tunes, Beyond Words, Heart Essence, A Point on the Wall, and Zen Walk. So with the same process this original handwritten score for Zen Walk manifested into an actual score that we started with that looked like this. 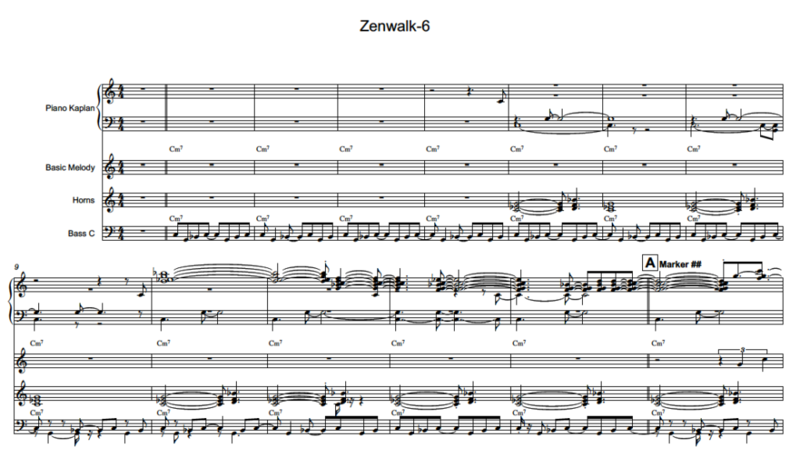 Zen Walk has this quarter note triplet melody, and originally used a simple bass part. Here is a original working track of Zen Walk before Andy and I started working on it for the actual release. The Steve Kaplan tracks were scored and we started re-orchestrating, and this is a snapshot of the version above during the mid point, and looks like this. Eventually Andy came up with a new highly dynamic bass line, we changed the speed, and started featuring an actual Acoustic Piano part. 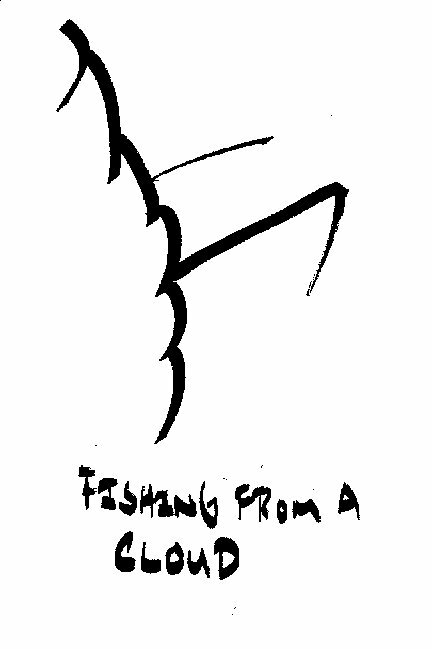 This is the final release track of Zen Walk. So the new Zen Walk release features 4 of these tracks, that use Steve Kaplan’s original Midi recordings. Only “Echo” is a new West – Pallett work, and we have a few more new ones that push this direction forward that we hope to release soon, if there is enough interest. Steve Kaplan, was a dear friend, an extraordinary musician, who is probably best known, for having composed the music for both the “Jeopardy” and “Wheel of Fortune” themes, playing keyboards on hundreds of Movie Soundtracks, and as a member of the group ZaZen. He unfortunately died in a plane crash in 2003, and I miss him a lot. You can get a copy of Zen Walk today from Band Camp. I work at John Hancock in Boston, 1 block from the Marathon Finish Line, worked on site Wednesday and Thursday it has been very somber and respectful in Boston this week. Very strange, found out today that our house in Vermont, is actually a 1938 Edward Hopper Painting. 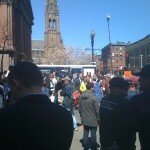 An Art Historian/writer called the other day and explained that they had discovered this, and wanted to take pictures. 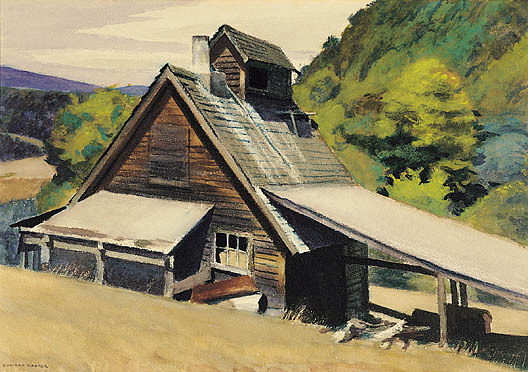 Painting is called “Vermont Sugar House” saw that it sold in 2007 for over $800,000. Seems that he stayed at the original farm that this Sugar shack was a part of. The view remains the same, and the original structure is actually the center of our house. Our studio is directly connected to one side, the other our living space. 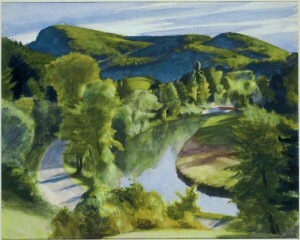 Appears that he stayed on the property and also painted a number of other works, one in the Boston MFA called 1st Branch of the White River, is the view from the other side of our property, off our driveway entrance. Yikes this is all I need at the moment….. Appears that this is the only structure he painted in Vermont, rest of the pieces are Landscapes. The auction catalog, mentioned that the “The landscape Hopper saw, as an artist, It only exists in his paintings, nowhere else… that the actual view doesn’t matter..” Well, 70 years later the view still looks the same, maybe a few trees have changed, but he did capture what is here.. So several questions come to mind. Is this actually my reality, or a Hopper reality? Did I destroy a piece of art by building a house, not knowing a piece of art existed? Probably the actual reality is, that the picture is worth more than the actual place. A place in time for one artist at one moment. Think I would find living in a Miro painting much more interesting.